Wildly popular in the 1970s, macrame is back and a huge trend in home and plant interiors. At The Every Space we sell a LOT of macrame hangers. They are suspended in every corner of our store and our home, looking planty and lush. Our plant hangers are all handmade and most are bespoke. Customers often have a plant, pot, or position in mind and we design to suit. Most days we are knotting away; it's quite therapeutic, a nice break from technology. We have our own take on the knotty trend; our styles are simple and our colours seasonal and bright, perfect for modern interiors. 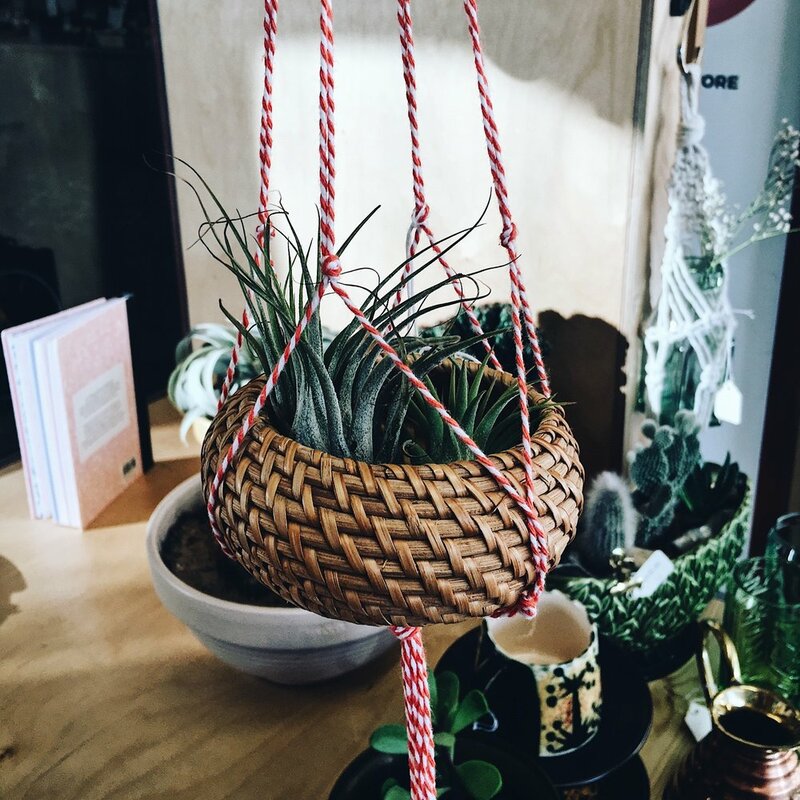 We like to mix things up a bit with vintage pots, paper plant pouches, seagrass baskets and handmade ceramics. We select interesting and unusual plants and especially love trailing greenery. Airplants also look gorgeous snuggled into mini pots and suspended on delicate twine. We encourage our customers to mix and match and try out different combinations. It's lovely when they take a snap of their new plant pal in their home and share it with us. Hanging plants is a perfect way to bring greenery into your home, safely out of the way of children and pets. Spider plants are ideal if you're looking for a larger plant. They are so easy to look after and can survive without much TLC. Their long tendrils of plant babies look magic pouring out of the pot and are so easy to propagate (you can have a whole family within a few month)s. If you're looking for something more delicate a 'String of Hearts' (Ceropegia woodii) is ideal. It's easy to look after and looks stunning. It will reward you for your care by producing pink trumpet shaped flowers at the end of the summer. If you prefer something more architectural, Haworthia Fascaita always gets a thumbs up. It's stripy, pointy leaves sticking upright straight always look stunning. 1. Decide on the position in your space. Think about the amount of light and level of humidity your plant pal needs. Curtain rails make excellent places for hanging pots as they benefit from the natural light but some plants will thrive in full sun whilst others will prefer a north facing or more shady vibe. Read the plant care advice and find a spot which suits. 2. Think about how you can make a feature of your plants. Check out the slide show below...plants in macrame look great clustered together in groups, hung from the ceiling or on the wall, from shelves or peg rails. 3. So, you've picked your plant and your spot and now you've got to secure it. Consider the weight of the plant and it's pot. Remember that your plant will get heavier after it has been watered. Toggle bolts with hooks (those bolts with arms that open out) are ideal for fixing into ceilings and are available from most DIY stores. 4. Watering is best done by removing your plant from it's pot. Give it a good soak and then leave it to drip for a bit before you put in back. Plant baths even have their own hash tag! #plantbath. If you feel inspired to create a modern macrame vibe in your space you can shop here for our most popular hangers, or get in touch direct for bespoke and custom orders. We also stock a range of best selling plant books. For style and plant inspiration to get you started or advice and care tips on house plants, cacti and succulents shop here.